A recipe for lemon muffins with a secret ingredient -- instant pudding mix. 1-2 tablespoon grated lemon zest (my friend taste tested and thought 1 was fine) or a teaspoon of good quality lemon oil. 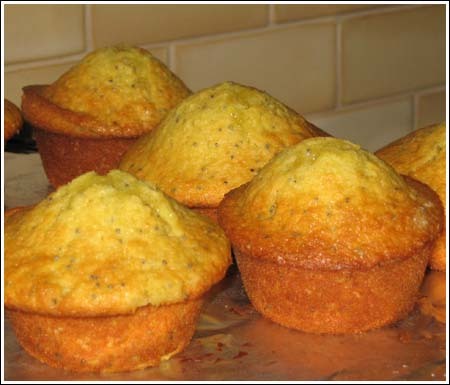 Preheat oven to 375 degrees F. Line 12 muffin cups with paper liners. In a large bowl, whisk together pudding mix, flour, sugar, baking powder, baking soda and salt. Stir in poppy seeds. In a medium bowl, whisk together eggs, milk, and lemon juice. Add this mixture to the dry ingredients and then pour in the melted butter. Using a wooden spoon, stir batter just until combined. Evenly divide batter between 12 muffin cups. Bake for 22 minutes or until a toothpick placed in the center comes out clean or with a few moist crumbs attached. Remove and place pan on a wire rack for 5 minutes. Remove the muffins from the pan and let cool. For cake flour muffins, use cake flour in place of all-purpose, substitute 1/4 cup of brown sugar for 1/4 cup of the granulated sugar, add 1 tablespoon of fresh lemon juice along with the lemon oil (or zest) and bake at 425 degrees F. for about 17 minutes. Also, I originally made only 10 muffins and filled the muffin cups almost to the top. You can do that, or you can go ahead and make 12 by putting slightly less batter in the cups.